The main problem of the horror genre of HK cinema is that it just isn’t scary. As a result, the thriller and horror genre have almost become indistinguishable. Therefore, The Third Eye is really a thriller, but it is just not thrilling enough. Despite some relatively creative camera placements and adequate producing from Andrew Lau, the film fails to make sense and in the process making the audience rather silly. This all, but confirms that Andrew Lau is far better in directing than producing, but his lofty reputation remains largely questionable. 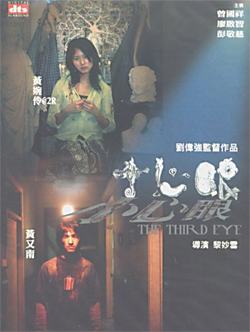 Apart from some moments of acting chops from Neo’s starlet Race Wong, some adequate suspense from the ever improving fat guy’s son in Derek Tsang and minor incidences of tension, The Third Eye remains largely a meaningless failure. Race Wong is an actress that Neo boldly claimed back in 2004 as the next Karena Lam, after her captivating display in Abnormal Beauty. Since then, Race Wong see, to have stalemated and despite impressing Neo as a Cocktail (2005), Wong never truly displayed her capabilities. While The Third Eye isn’t exactly the right material to prove Neo’s right for once, Wong provided glimpses of her underrated talent in flashes rather than coherently. Blame it on the script, Andrew Lau or whatever, but seriously Race Wong, do yourself a flavour and try something that can enhance your abilities. While Neo is staying true to his words from 3 yrs ago, it is disappointing and exciting to witness actresses like Isabella, Charlene and Gillian improving at a much faster rate than the aforementioned personnel. The son of Eric, Derek Tsang is undoubtedly talented and with time, there is no reason why he cannot surpass his predecessor’s achievements. It is yet another convincing performance and perhaps alongside Race Wong the only two bright spots for the audience to cheer for. As for Shine (Wong Yau Nam) a few words of advice – go back to acting school.